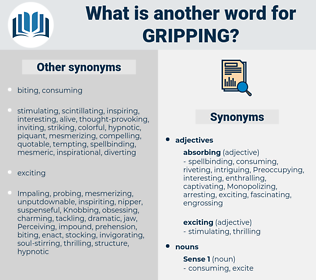 What is another word for gripping? Influencing, Impacting, captivating, Plaguing, Afflicting, confronting, devastating, Involving, Storming, holding, sweeping, affecting, Besetting. unexciting, repulsive, unstimulating, boring, uninteresting. tiring, dull, disheartening, dispiriting, demoralizing, discouraging, tiresome, pedantic, wearying, monotonous, drab, Operose, wearisome, heavy, sterile, dry, pedestrian, tedious, humdrum, dreary. The appeal of her beauty gave place to a stronger, more gripping appeal, never felt by him before. They went close together, John gripping her arm, in the old way, to steer her.